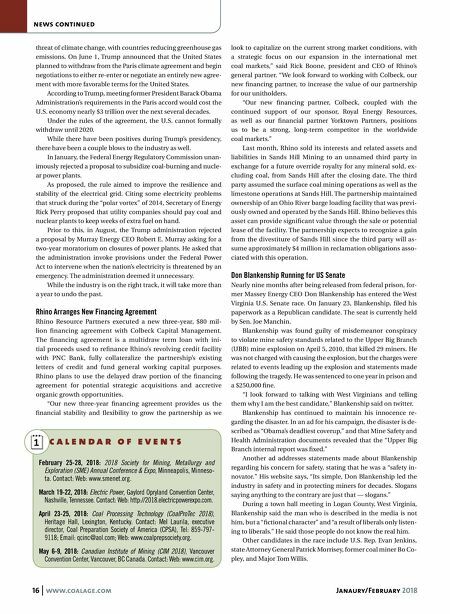 16 www.coalage.com Janaury/February 2018 news continued c a l e n d a r o f e v e n t s February 25-28, 2018: 2018 Society for Mining, Metallurgy and Exploration (SME) Annual Conference & Expo, Minneapolis, Minneso- ta. Contact: Web: www.smenet.org. March 19-22, 2018: Electric Power, Gaylord Opryland Convention Center, Nashville, Tennessee. Contact: Web: http://2018.electricpowerexpo.com. April 23-25, 2018: Coal Processing Technology (CoalProTec 2018), Heritage Hall, Lexington, Kentucky. 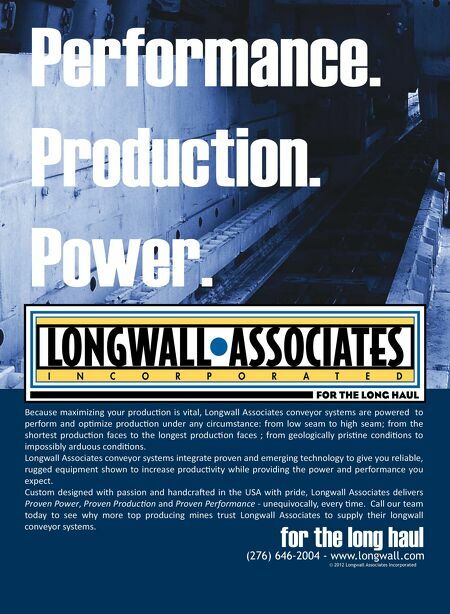 Contact: Mel Laurila, executive director, Coal Preparation Society of America (CPSA), Tel: 859-797- 9118; Email: qcinc@aol.com; Web: www.coalprepsociety.org. May 6-9, 2018: Canadian Institute of Mining (CIM 2018), Vancouver Convention Center, Vancouver, BC Canada. Contact: Web: www.cim.org. threat of climate change, with countries reducing greenhouse gas emissions. On June 1, Trump announced that the United States planned to withdraw from the Paris climate agreement and begin negotiations to either re-enter or negotiate an entirely new agree- ment with more favorable terms for the United States. According to Trump, meeting former President Barack Obama Administration's requirements in the Paris accord would cost the U.S. economy nearly $3 trillion over the next several decades. Under the rules of the agreement, the U.S. cannot formally withdraw until 2020. While there have been positives during Trump's presidency, there have been a couple blows to the industry as well. In January, the Federal Energy Regulatory Commission unan- imously rejected a proposal to subsidize coal-burning and nucle- ar power plants. As proposed, the rule aimed to improve the resilience and stability of the electrical grid. Citing some electricity problems that struck during the "polar vortex" of 2014, Secretary of Energy Rick Perry proposed that utility companies should pay coal and nuclear plants to keep weeks of extra fuel on hand. Prior to this, in August, the Trump administration rejected a proposal by Murray Energy CEO Robert E. Murray asking for a two-year moratorium on closures of power plants. He asked that the administration invoke provisions under the Federal Power Act to intervene when the nation's electricity is threatened by an emergency. The administration deemed it unnecessary. While the industry is on the right track, it will take more than a year to undo the past. Rhino Arranges New Financing Agreement Rhino Resource Partners executed a new three-year, $80 mil- lion financing agreement with Colbeck Capital Management. The financing agreement is a multidraw term loan with ini- tial proceeds used to refinance Rhino's revolving credit facility with PNC Bank, fully collateralize the partnership's existing letters of credit and fund general working capital purposes. Rhino plans to use the delayed draw portion of the financing agreement for potential strategic acquisitions and accretive organic growth opportunities. "Our new three-year financing agreement provides us the financial stability and flexibility to grow the partnership as we look to capitalize on the current strong market conditions, with a strategic focus on our expansion in the international met coal markets," said Rick Boone, president and CEO of Rhino's general partner. "We look forward to working with Colbeck, our new financing partner, to increase the value of our partnership for our unitholders. "Our new financing partner, Colbeck, coupled with the continued support of our sponsor, Royal Energy Resources, as well as our financial partner Yorktown Partners, positions us to be a strong, long-term competitor in the worldwide coal markets." Last month, Rhino sold its interests and related assets and liabilities in Sands Hill Mining to an unnamed third party in exchange for a future override royalty for any mineral sold, ex- cluding coal, from Sands Hill after the closing date. The third party assumed the surface coal mining operations as well as the limestone operations at Sands Hill. The partnership maintained ownership of an Ohio River barge loading facility that was previ- ously owned and operated by the Sands Hill. Rhino believes this asset can provide significant value through the sale or potential lease of the facility. The partnership expects to recognize a gain from the divestiture of Sands Hill since the third party will as- sume approximately $4 million in reclamation obligations asso- ciated with this operation. Don Blankenship Running for US Senate Nearly nine months after being released from federal prison, for- mer Massey Energy CEO Don Blankenship has entered the West Virginia U.S. Senate race. On January 23, Blankenship, filed his paperwork as a Republican candidate. The seat is currently held by Sen. Joe Manchin. Blankenship was found guilty of misdemeanor conspiracy to violate mine safety standards related to the Upper Big Branch (UBB) mine explosion on April 5, 2010, that killed 29 miners. He was not charged with causing the explosion, but the charges were related to events leading up the explosion and statements made following the tragedy. He was sentenced to one year in prison and a $250,000 fine. "I look forward to talking with West Virginians and telling them why I am the best candidate," Blankenship said on twitter. Blankenship has continued to maintain his innocence re- garding the disaster. In an ad for his campaign, the disaster is de- scribed as "Obama's deadliest coverup," and that Mine Safety and Health Administration documents revealed that the "Upper Big Branch internal report was fixed." Another ad addresses statements made about Blankenship regarding his concern for safety, stating that he was a "safety in- novator." His website says, "Its simple, Don Blankenship led the industry in safety and in protecting miners for decades. Slogans saying anything to the contrary are just that — slogans." During a town hall meeting in Logan County, West Virginia, Blankenship said the man who is described in the media is not him, but a "fictional character" and "a result of liberals only listen- ing to liberals." He said those people do not know the real him. Other candidates in the race include U.S. Rep. Evan Jenkins, state Attorney General Patrick Morrisey, former coal miner Bo Co- pley, and Major Tom Willis.